Families, houses, cars, and guns. 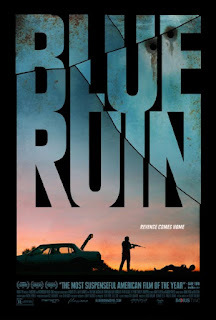 Blue Ruin could almost be reworked as a dark, brooding soap opera crossed with Game of Thrones: two families can’t get along—which, in this case, means occasionally killing each other. 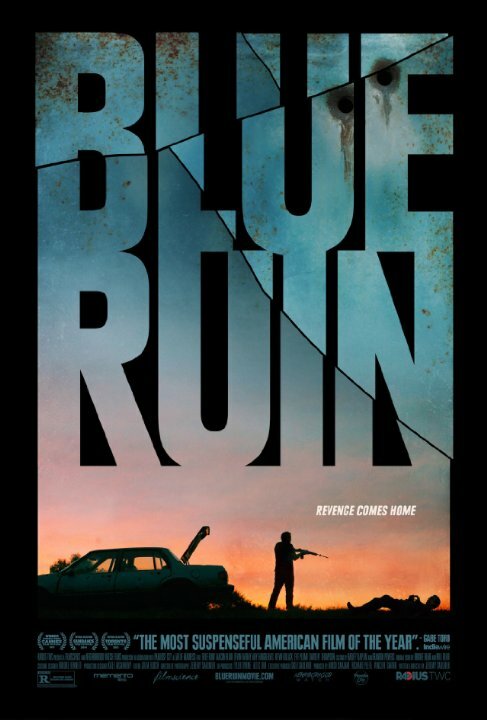 What strikes me first about Blue Ruin is the economy of its visual storytelling (the first act is largely silent). It opens in a suburban house with still frames of images which identify it with a peaceful tranquility. Family photos. White wallpaper. Clean rooms. Cut to a pearly white bathtub with a tattooed arm sticking out of it. Something doesn’t belong. This is confirmed when Dwight (our protagonist) leaps out at a sudden noise and climbs out the window. This is a man who is used to the comforts of home living (he’s taking a bath rather than a shower) but no longer belongs in this domestic space. Exiled. Its other strong suit is its complex morality. Dwight wants revenge for the death of his parents, an event which seems to have had a profound effect on his psyche (marked by his overgrown beard and unsettled inward performance), but the film has us constantly questioning whose side we should be on. Once we’ve begun to assume that our protagonist is an anti-hero, we see reasons why his actions might have been justified. It’s a world where nobody comes out clean, and this muddled morality is perfectly executed from start to finish. Oh yeah, and the movie was made with no money. None. I mean, $420,000 is a lot of money to me, but it’s also an amount of money I could feasibly imagine obtaining in my lifetime, unlike 99% of other movie budgets. But what’s amazing isn’t that they pulled it off with a shoestring budget—that’s been done before, obviously—it’s how beautifully they managed to pull it off in spite of this limitation. The visual aesthetic of the film is just gorgeous (it really is a blue ruin, even in its color palette). You can tell there’s a lot of passion behind the camera, and the film is consistently engaging and occasionally breathtaking. I'm so glad I finally caught up with this modern twist on the revenge thriller (thanks Netflix!) and it turned out to be one of my favorite new discoveries of Junesploitation so far (I think I like Investigation of a Citizen Above Suspicion more, but that one's barely exploitation—and after watching this movie but before posting the review I’ve now also seen Possession, which I’d rank above this as well). But yeah, in spite of my now multiple caveats, this was definitely a wonderful surprise which I’d easily recommend to anyone.